PyCon AU 2016 starts next week for five days of mini-confs, the main conference and two days of sprints. With all that sitting around, we want you to pack your running gear and join us for a run each morning at 7am. The runs are intended to be inclusive and the pace is civilised enough to chat along the way — these are groups runs, not races! All of the details, including the routes with maps, are on the conference wiki. Online registration is now open for PyCon Australia 2016, including for the Science and Data miniconference. The seventh PyCon Australia is being held in Melbourne, Victoria from August 12th – 16th at the Melbourne Convention and Exhibition Centre, and will draw hundreds of Python developers, enthusiasts and students from Australasia and afar. Starting today, early bird offers are up for grabs. To take advantage of these discounted ticket rates, be among the first 90 to register. To begin the registration process, and find out more about each level of ticket, visit the conference registration page. PyCon Australia has endeavoured to keep tickets as affordable as possible, and financial assistance is also available. We are able to make such offers thanks to our Sponsors and Contributors. Posted in Python	| Comments Off on PyCon AU 2016 registrations are open! The call for papers for PyCon Australia, including for the Science and Data miniconference, is down to its last week! Make sure you register and get your talk/tutorial ideas down as soon as possible. Submissions can be edited up until the deadline. Applications for financial assistance are also open, and we strongly encourage potential speakers to apply if needed. We can cover not only conference registration and travel/accommodation costs, but also substitute teacher costs, childcare, carer costs and other costs related to equity of access. Posted in Python	| Comments Off on PyCon AU’s Call for Proposals: one week to go! PyCon AU 2016 is excited to announce the third of our special events, the Python Science and Data mini-conference. The Science and Data mini-conference is a one-day forum for people using Python to tackle commercial and research problems in science, engineering and data science.Python is a very popular choice for a wide range of scientific disciplines and has a strong set of libraries, frameworks and tools for scientific computing, including the Jupyter notebook, SciPy, pandas and Scikit (to name just a few). The Science and Data mini-conference is a chance to showcase the use of new and innovative uses for Python in disciplines such as genomics, computer vision, mathematics, high performance numerical computing, fintech, machine learning and data analysis. The mini-conference is also a great opportunity to network with other scientific Python developers and to track some of the emerging trends in the scientific Python ecosystem. We look forward to seeing you at the third PyCon AU Science and Data mini-conference on August 12, 2016. Here the slides (PDF format) from my PyCon AU 2015 talk. PyCon AU 2015 starts at the end of July and I would encourage you to pack your running gear and join us for an informal morning run before the conference each day. These runs are intended to be inclusive rather than a race, and are designed to be about 5 km long. The Brisbane Marathon is on the Sunday morning and some of the conference attendees have entered (there are a range of events: 5km, 10km, half marathon and marathon). If you want to do a serious run on the Sunday, then get your entry in soon! Otherwise, we will still plan on having a casual group run that will do its best to avoid the marathon route. PyCon AU 2015 will be held again in Brisbane, start on July 31 with a set of mini-conferences, including the return of the science/data mini-conference. This year’s science/data miniconf has ten excellent talks, covering a diverse range of uses for Python in science, big data, and AI/machine learning. The miniconf’s full schedule is now online and we hope to see you at the miniconf in Brisbane on July 31. The forecast for this year’s Around the Bay in a Day ride was warm and windy. It turned out to be an almost perfect day to do the 250km counter-clockwise circumnavigation of Port Phillip Bay by bike. 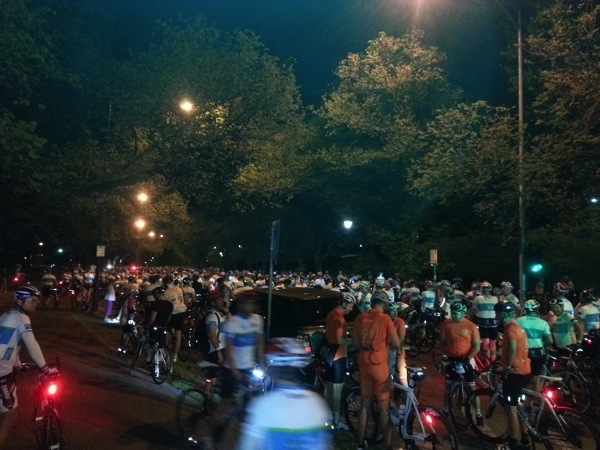 The start was scheduled for 5:30am, but with multiple waves of 210km and 250km riders, we didn’t end up leaving until 5:50. I rode with a bunch of friends and it was a casual pace down to Queenscliff. We ended up on the 1pm ferry and by the time we disembarked in Sorrento, the north-westerly wind that had blown us down had swung around to a south-westerly that helped push us home. 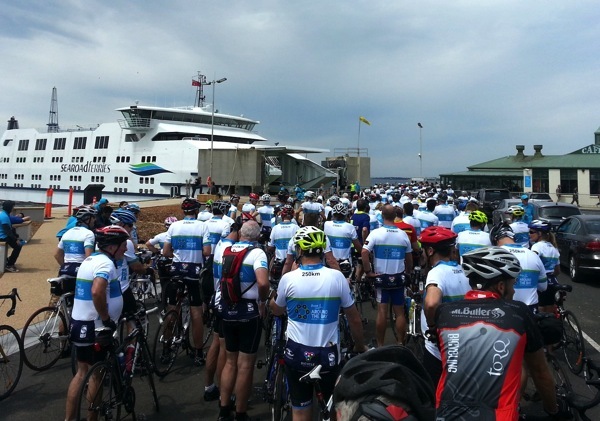 This was about my tenth AtB ride (I’ve lost count) and after 21 years, it seems that Bicycle Victoria has almost figured out how to run the event properly: the rest stops were better organised (apart from the farcical lack of water in Geelong), the ferry system ran smoothly and the marshalling was excellent. Queuing for the ferry worked well: we had time for lunch and a decent coffee in town before queueing up and boarding fairly quickly, as you can see in the photo above. It was a very uneventful ride: no punctures, the weather was great, Richard didn’t shatter a femur this year and everyone finished in fine form. Here’s the Strava data; I measured it with my GPS watch as 240km, not the advertised 250km, and the shorter distance was consistent with what other people measured. Note that next month’s talk is on November 10th instead of the 3rd, to avoid the Cup Day long weekend. Food and drink is logged with MyFitnessPal. This gives me total kilojoules intake per day. MFP has a clunky web app, a sub-par Android app and an API that is not yet open to the public, but the food database is far better than any of the competitors that I have checked. Steps, water consumption and sleep are all logged with a FitBit One. I love the One. Weight is logged with a Withings wireless scale, which is connected to Withings Healthmate. Every run, ride and hike is tracked with a Garmin Fenix. The Fenix (version 1) is a flawed device in many ways, but still a fantastic watch for outdoor activities. Over two years on, and I still prefer it over the three generations of the Suunto Ambit and see no compelling reason to upgrade to the new Fenix 2 or any of the Garmin sports watches, such as as the Forerunner series. All my runs, rides and hikes are uploaded into Endomondo. Endomondo is my preferred exercise tracking tool in terms of feature set, ease of use, and ease of accessing my data compared to Strava, MapMyRun and RunKeeper. It has finally replaced the Excel-based exercise logging spreadsheet that I have used for the last decade. Since I have joined the Vigor and PlanetInnovation cycling “clubs”on Strava, any ride longer than 20km is also uploaded into Strava. Temperature is logged with a Garmin Tempe, connected to the Fenix via ANT+. Heart rate is logged with a Mio Link, connected to the Fenix. Some of the services are linked to eliminate data duplication: Healthmate is connected to MyFitnessPal, while MyFitnessPal and Endomondo are both connected to FitBit, so I can easily review total kilojoules in and out per day and per week. There are services I want to look at for better reporting and analysis, such as TicTrac and exist.io; until then I find the combination of Endomondo and Fitbit works well enough for my data analysis needs. I will follow this post up with another one answering the question of “why do all this?” another time.